FOR THE MEATLOAF: Heat oil in nonstick 12 inch skillet over medium heat until shimmering. Add onion and cook until browned, 6 to 8 minutes. Add garlic and cook until fragrant, about 30 seconds. Transfer to large bowl. Process saltines in food processor until finely ground; transfer to bowl with onion mixture. Pulse beef and bratwurst in food processor until just combined. Add meat mixture, cream, parsley, eggs and yolk, mustard, Worcestershire, salt, pepper, and thyme to bowl and knead gently until combined. Press meatloaf mixture into loaf pans. Freeze, uncovered, until firm, at least 1 hour. Wrap pans with plastic wrap, pressing plastic directly on surface of meat, and then wrap with aluminum foil. Freeze for up to 1 month. Adjust oven rack to middle position and heat oven to 350degree. Unwrap 1 meatloaf and set loaf pan in roasting pan. Place roasting pan on rack and pour boiling water into pan until water reaches 1 inch from top of loaf. Bake center of meatloaf registers 150 degrees, 40 to 50 minutes. FOR THE GLAZE: Meanwhile, whisk all glaze ingredients together in saucepan until sugar dissolves. Simmer glaze over medium heat until slightly thickened, about 2 minutes. Cover and keep warm. When meatloaf register 150 degrees, remove pan from oven. 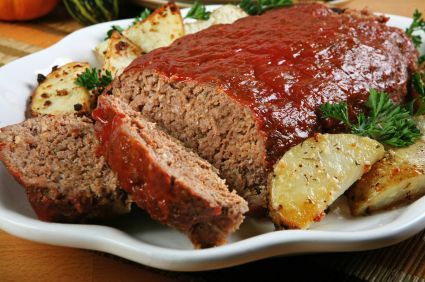 Turn meatloaf out onto foil lined rimmed baking sheet and brush 2 tablespoons glaze over top and sides of loaf. Adjust oven rack to upper meddle position and heat broiler. Broil until glaze begins to brown and center of loaf registers 160 degrees, 5 to 10 minutes. Transfer to serving platter, tent loosely with foil, and let rest for 20 minutes. Slice and serve, passing remaining glaze separately. End.